Start Your Horsemanship At 50! / Start Your Horsemanship At 50! Sometimes, with that second sentence goes to a scary place. There was an ‘incident’. Maybe it was physically painful such as a fall or broken bones and sometimes it was a frightening experience. Sometimes an “authority” MADE the person “get back on”. Sometimes they never touched a horse again or if they did, it was with a completely different emotional response. Sometimes they loved their horse time, but life got in the way -school/college, marriage, kids, career, etc and it didn’t support a horse life. But nonetheless, once horses are under your skin, they’re pretty much there for life whether you actively pursue it or just keep dreaming about “some day”. While it’s a fabulous time for men to start their horsemanship journey, too, I’m focusing on women here because there are a lot more of them with this dream and because… I want to. It’s time to realize your DREAM. And what’s even better is that there is a better way to realize it than you may think. Horsemanship has had huge changes in the last couple of decades. Although many still do the same horse training things the same way, it’s not the wave of the future. 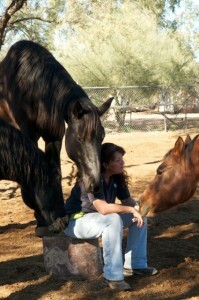 There are options that are so much better now for both the horses and a better thinking human who is interested in a real relationship with the horse while still enjoying all the fun and exploration, skills and experiences, new places and people with this truly mystical being-the horse. Your kids are grown and out of the house now (unless they’re boomerangers, but we’re not going there in this article), which generally means you have a bit more time to explore what you’ve wanted to do since you were a kid. With the offspring gone, it’s likely that you have some flexibility with your income that you can devote to your “personal growth fund”—horsemanship. Before we get into the fabulousness of horses and what you’ll experience WITH them, I’m going to run through a few side effects that are well worth considering in and of themselves. Yep, how about that for a side effect? Now, the great news is you can do however much or little you want of this exercise thing. If you plan to ride well and be able to handle the natural happenings of being with and riding horses, it would behoove you to be in some decent shape. But, of course, if you want to live a comfortable life after 50, you need to participate in some exercise anyway, right? You might as well be doing it with horses. Additionally, the new non-riding concepts, skills and fun available with horses make your options great even if you don’t want to get too much exercise. There are so many horse people out there. There are a lot of different styles and types of horse people. There are hundreds of different horse breeds and disciplines and there are literally hundreds of thousands of participants in each. Some of the groups are at a high end that limits who participates with incredibly expensive horses, events and tack. But, backyard horse people are a huge part of the horse world and thus you can find them just about everywhere. And there is every possibility in between. Western or English, dressage, pleasure, trail, or all of the above or none of the above, it doesn’t matter. Lets explore your options! Find the real you didn’t know you were. Sounds a bit nebulous and sinister you say? I’m including it in this side effect part here because most people don’t know that it’s going to happen and they don’t go into horsemanship with this intent. However, the horsemanship I teach and promote will do things for you and your personal worth, power, understanding and success that you would never imagine. 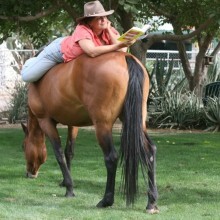 This is connected to the very best of what you can achieve with this type of horsemanship. Some great reasons for starting your horsemanship now: You are in such a different place emotionally, mentally, physically and spiritually now that you really can have the best horsemanship possible. Sure, when you’re young you bounce better when things don’t go quite right. But much of the time, youth gets in the way of a profound understanding of relationship with the horse, the intelligence of the horse and the bounty for you when you recognize these attributes along with the newer concepts of horsemanship will astound you. Youth wants to run and the horse is perceived as more of a means to an end than the end itself. Patience isn’t generally real high on the youth priority list and it just so happens that patience to learn and understand is a high priority to horses and for exceptional horsemanship. Now lets address an issue that may be lurking beneath the surface. Fear. Fear of… well, here’s where lots of women get stuck. Fear. Luckily, I have some great ways to cure that malady. We could pull out the old Dr Phil standard – “You can’t fix something you don’t acknowledge” line and we shall because it’s true. It’s difficult to admit fear in any case and particularly difficult to admit it with horses because there is such a love affair with horses that it’s tough to go there. Then, when you admit you have some fears, you tend to leave it right there. Here’s the trick – the word fear is way too broad. You can’t get over it because it’s not really identifying what the issue really is as fear is to encompassing. We need to get much more particular and precise. And since Exceptional Horsemanship requires precision anyway, we can just jump right into this fear thing and conquer it and get on with our horse life. Being taken for a ride? By the horse and/or the money machine? Just WHAT is it? Because we can work through it if we know exactly what it is. There are so many fun, fun, fun and exciting things to do with horses as well as things that are comforting and enlightening and it’s all possible, ALL possible to do safely as you build your knowledge, develop new skills, learn new world horsemanship while being challenged in all areas to become who you really want to be with the most-bestest horse ever.